b. London, England, 1938; d. Knysna, Western Cape, 2015. Gerry Dixon is a sculptor with an unorthodox approach to materials, which lends itself to provocative, often humorous expression. 1964: Emigrated to South Africa. 2000: Returned to South Africa. 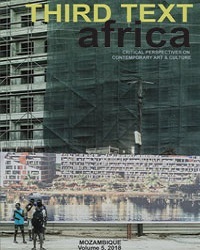 Gallery Delta, Harare (1998, 1996, 1990, 1989). Universities of Cape Town, Natal (Pietermaritzburg) and Stellenbosch (1974-77). 2007: ReCenter, Look Out Hill, Khayelitsha, Cape Town.africa south, AVA, Cape Town. 1989-91, 1994-98: Zimbabwe Heritage, National Gallery of Zimbabwe, Harare. 1995, 1993: Pachi Pamwe, Harare. 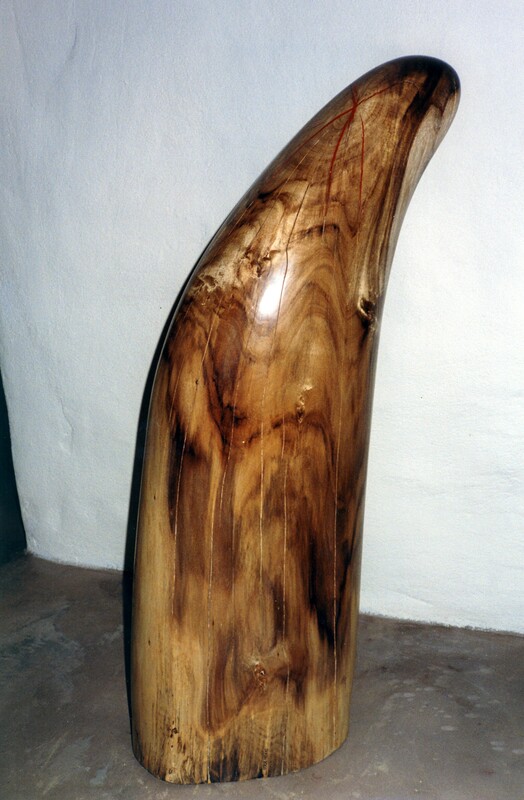 1990, 1991: Sculpture in Wood, National Gallery of Zimbabwe, Harare. 1990: Zimbabwe Heritage, Auckland, New Zealand.c. 1990: Commonwealth exhibition, Australia. 1989-96: Annual group exhibitions, Gallery Delta. 1979-81: Group exhibitions, Cape Town. 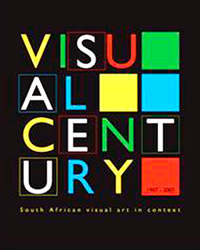 1977: Group exhibition, Cape Town. 1974: Group Exhibition [Aquarius/ Nusas] Universities of Natal (Pietermaritzburg) and Cape Town. 1995: Pachi Pamwe International Workshop, Shurugwi, Zimbabwe. 1993: Pachi Pamwe International Workshop, Marondera, Zimbabwe. 1974: Aquarius (Nusas) Workshop, University of Natal, Pietermaritzburg. New Zealand College. Dieleman Gallery, BrusselsPrivate collections in Australia, Cyprus, Germany, Mauritius, Netherlands, South Africa, UK, USA, and Zimbabwe. 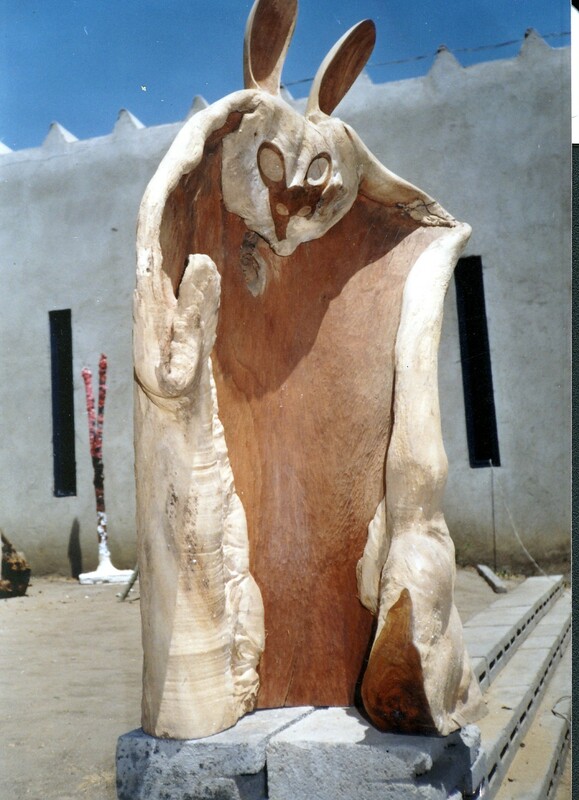 1994 Sculpture in Wood, Alliance Francaise Harare. 1989 Baringa/ Nedlaw Annual Exhibition of Contemporary Visual Arts, National Gallery of Zimbabwe, Harare. 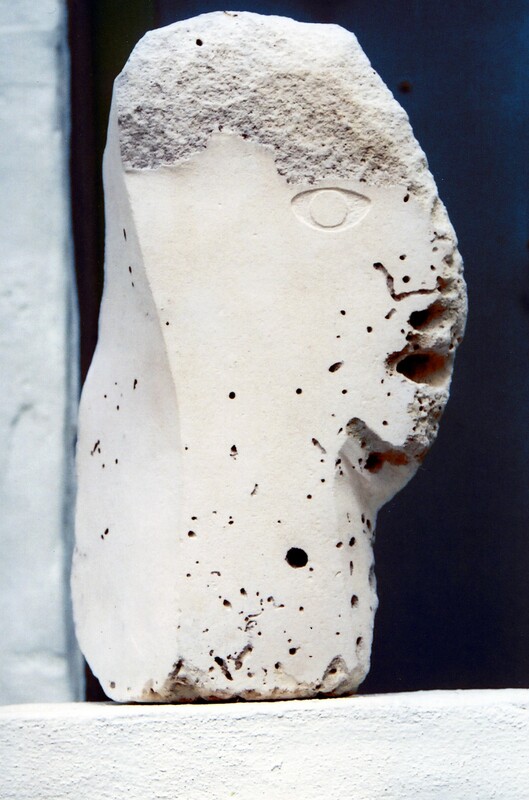 1998 Gillian Wright, “Gerry Dixon – the last parrot”, Gallery, pp. 19-25. 1996 Murray Mc Cartney, “Gerry Dixon on site”, Gallery, December: pp. 2-7 (plus both covers). 1994 Gallery, December no.21974: “Loners”, Speak, Cape Town. 1998, 1995, 1989: Award of Merit, Zimbabwe Heritage exhibitions, National Gallery of Zimbabwe, Harare. 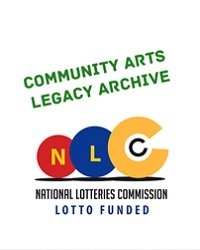 1994, 1989: Highly Commended Certificate, Zimbabwe Heritage exhibitions, National Gallery of Zimbabwe, Harare. 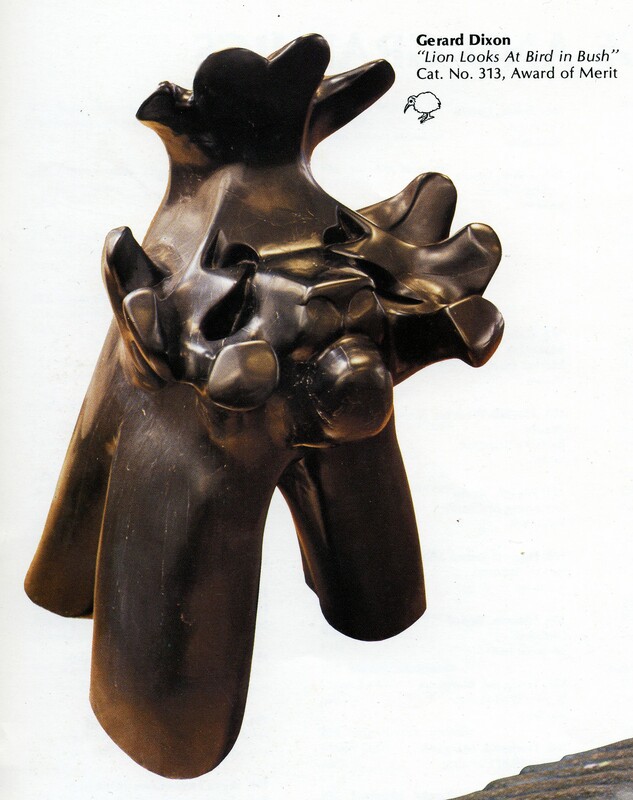 1991 Overall Award of Distinction, Sculpture in Wood, National Gallery of Zimbabwe, Harare. 1997 Alliance Francaise [Wood sculpture, Central Park, Harare]. 1972 Multiple Columns (sculpture), earthworks, stone & wood. The Point (sculpture), wood, metal, plastic. Reality (5 component painting), acrylic on board, 70 x 70cm each. Peace?, oil on board, 7 x 7m; all Cape Town. 1964 Burning event. Burned all paintings (except Paranoia), London. 1963 Paranoia. oil on canvas, 2.5 x 1.5m, Brisbane (first painting). 1959-61: Chalk graffiti, London Underground (1959-61). 1973 Trance, 4 x 20 minute Super 8 recordings of various light phenomena, mainly reflections off water. To be edited for continuous on 5 x 3 m digital screen. Shown at first “Other” Film Festival, Cape Town. (1973-5). Spontaneous Music Ensemble, Peter Klatzow, piano; David Kantey, guitar & vibraphone; Dixon, sinewaves & drum, South African College of Music, UCT. Pianist for Terry Riley’s In âCâ, South African College of Music, UCT. Intermediate Formations, music group with Sherwin Mark, Mike Hammon, & others, South African College of Music, UCT. Solo Drumming, Pencil on upturned wastepaper bin with amplification, University of Natal, Pietermaritzburg. 1988: Produced mobile “Scratch” version for Harare. Operating around high density suburbs. Biggest event: Independence Day Celebrations, Central Park, Harare1983. Sound system used for miscellaneous public events until “destroyed by opposing forces”. 1978-82: Formed Modern Dance Syndicate, “Scratch” Dance Club, Cape Town. Originated bass sound system and DJ controls with 5 channel equilizer- first time in South Africa. 1973-74: Designed and built 40 sound source continuous sine/ square wave tones for performance. 1972 “Old Cape Seed Loaf” created recipe and name: now available throughout South Africa. 1971-74: Facilitated importation of first sunflower seed hulling machine. Wheat Control Board refused licence to open bakery. Since 1998: Continuous production of paintings and concept sculpture. 1966-70: Advertising Copywriter/ Creative Director, Newman & Associate (Dixon was the “associate”), Johannesburg. 1962 8 month long oil survey, West Queensland Desert, Australia. 1954-61: Diesl apprenticeship (Transport: manufacturing, design, experimental research), Leyland (London).Chief Design Engineer, Leyland (Johannesburg): Transport Trailer Division – designed and built first car transporters in South Africa. Designed and built metal-elastic abnormal load suspension (3 axles to carry 60 tons) for hydroelectric component transport). 1971: Economics I & II, University of Cape Town. Mobile: +27 (0) 83 469 3053, Tel: +27(0)44 3826476). If you google ‘Gerry Dixon” you will find there are many people with that name. But everyone who knew the Gerry Dixon we did, will, most likely, only know some of the people who made up the extraordinarily rich personality that he was. Certainly, name aside, there was probably no British born person of his generation whose life followed the same, or even similar path, and while there are many artists whose work crosses the visual and the sonic, it is unlikely that his creative output could be confused with that of any other. Gerard Dixon was born in Southhall, London on 24 June, 1938. He grew up in an England devastated by the war. Gerry was brought up by his working class, socialist father, having lost his mother at a young age, and having been separated from his younger sister who was sent to an orphanage. He grew up distrusting authority, and deeply resistant to conformity. Apprenticed, from the age of 12 as an engineer to Leyland, he was constantly looking outwards, and it is perhaps not surprising that his interest went into exploring the vestiges of empire, then recently reconstituted as the Commonwealth. In 1961 he emigrated to Australia, experiencing truly wild times with characters that, as he put it, were at their sweetest 200 times tougher than Crocodile Dundee. It was, strange as it may seem, in the Australian outback that he discovered jazz, and it was also in the desert that he first found his calling as an artist. In Brisbane, 1963, he began painting, and he was proud that his first significant painting was called “paranoia”, before the term had entered common usage. Returning to London, he decided to travel over land, beginning in India. It was during this journey that he ‘discovered’ hemp and the ‘East’ before these became fashionable in the counter culture of the 1960s. Back in England, Gerry responded to a notice in a British newspaper, inviting Britons to emigrate to South Africa. In retrospect this advertisement can be understood as being part of the South African government’s efforts to bolster white rule by recruiting European settlers in the post-Sharpeville period. But Gerry knew little about South African politics, and fancied an easy (or easier) life in a imagined Johannesburg that he thought was on the banks of a river (The Vaal), where there would be lots of fishing and swimming. This idea was shattered on his arrival, and certainly he was to prove to be anything but an ordinary settler. Initially Gerry found work as a chief design engineer at Leyland, where his achievements included designing the first articulated vehicle trailers in South Africa. Always alert to music, he was delighted to discover Kohinoor records, whose collection of jazz music he found to be far more extensive than what was available in London at that time. Barely a year after his arrival Gerry was organizing monthly live music dance sessions featuring black musicians in central Johannesburg. Predictably, these events were closed down by the security police. 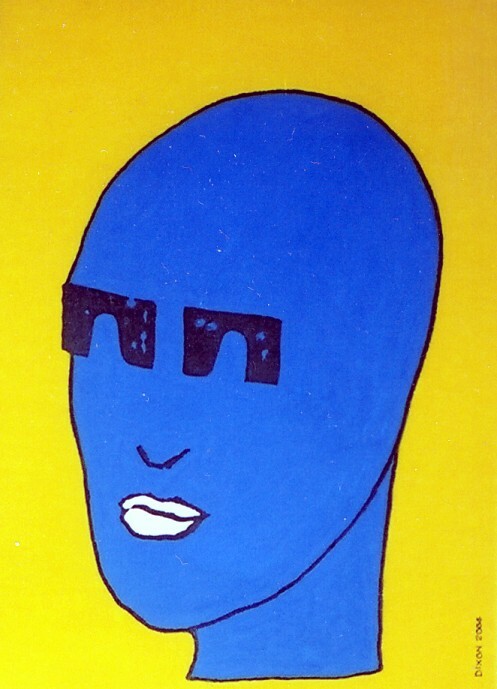 In 1966 Gerry moved on to working as a copyrighter and creative director, as the un-named associate in a media company. This period gave him perspectives into the links between marketing and social control, issues that were to preoccupy him throughout most his adult life. In 1970 Gerry moved to Cape Town, where, he was inspired by the idea of ‘social sculpture’ advocated by (German conceptual artist) Joseph Beuys, where art involved real people in real time, with an emphasis on deconditioning society. He created “Old Cape Seed Loaf”, one of the first health bread alternatives in South Africa that is still on the market. He applied for a license to open a bakery, but this was turned down by the authorities. Undeterred Gerry continued to bake, distributing his loaves by hand to the few bakeries that were receptive to his product. The early 1970s were also important for Gerry’s experimental music practice. He had been drumming sporadically from at least the early 1960s, but after discovering Terry Riley’s ‘In C”, his focus shifted towards electronic music. His proudest achievement was the sine-wave machine he built that he used for experimental performances, mostly conducted at various sites at the University of Cape Town, including the Psychology Department, College of Music and Fine Arts school. In 1979 Gerry met Henry (Coombes, Mauritian artist and dj and a lifelong friend), and through Henry he met Jane (Taylor), Frankie (Kruger), myself and others, with an unofficial ‘headquarters’ at 10 Camp Street. He moved in with Jane, (her son) Dylan, and (Henry’s son) Sarane to 22 Camp Street, with the two homes becoming the effective social and organizational hub of what was to become an extraordinary chapter in the lives of many people living in Cape Town. At that time, we would gatecrash other people’s parties with Henry’s unique record collection, (mostly imported reggae and new wave). Without Gerry this would probably have not progressed beyond a series of exuberant parties. 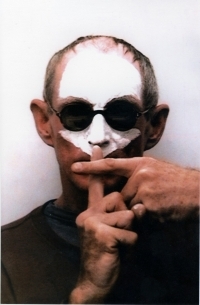 It was Gerry who saw the possibilities for a new club culture, and he organized what was initially a one-night event in Sea Point (at Ellingtons, the in-house club for the hotel Claridges). Borrowing the title of a song by Canadian band Pere Ubu, the event announced itself as ‘The Modern Dance’. An all-white affair, attended by what then represented the emerging ‘alternative’ music scene in Cape Town, the first night was successful enough for us to be invited back five weeks later, then three weeks. One of our circle, Lee (Hobbs), identified a gay club in the centre of town, 1886 Long Street, with a declining clientele. We were given the Wednesday night slot, which were so successful that we soon took over the Friday and Saturday slots as well. While 1886 was pumping, Gerry was quietly putting together the pieces to take this project to another level. Having registered a private company, The Modern Dance Syndicate, he secured the lease to an abandoned club at 88 Shortmarket Street. (These premises, then filled with rubble, was formerly The Navigators Den, a dive for sailors and prostitutes that is memorialized in the history of South African documentary photography through the photographs of Billy Monk). The new club, called Scratch, (named after Jamaican music legend Lee Scratch Perry), opened in 1979. Gerry’s role in Scratch was pivotal. He designed the sound-system, second to none, as everyone who was there can vouch. He put together the steady supply of new music from (London based) Dub Vendor, this in the time of the cultural boycott. He ensured the smooth running of events, and he was the frontline person dealing with the authorities. He also intermittently played records, selecting the slowest, heaviest tunes, some of which, like Lee Perry’s ‘Who slew the chicken?’, I’m sure were never played in any club or sound system anywhere! And who can forget his dancing? He would pick his spot where he got the optimum benefits of the sound and hold it as long as he was not needed elsewhere. Scratch’s biggest achievement was in breaking the racist, sexist apartheid mould. It was a genuinely integrated club, that apart from the initial core of rebellious white youth, attracted hundreds of young, emerging rastas from the townships. It was a place where women could dance freely without harassment, and where gays and lesbians were welcome. There was little décor, the club was painted black, broken only by a map of Africa in front of the elevated dj booth, and a large florescent orange ‘No’ that Gerry painted on the one wall. It was inevitable that Scratch would be identified as a site of social deviance. Breaking racial, gender and sexual taboos, it was an island of cultural resistance in an oppressive ocean. When the authorities gave up searching for evidence of selling alcohol without a licence, something we didn’t do as we saw alcohol as part of the culture we rejected, they enacted archaic legislation to prevent dancing on Sundays, closing us down at midnight on Saturday evenings. We responded by opening earlier, and eventually they gave that one up, but resorted to increasing raids on the club, releasing teargas canisters into the premises. The police also began turning away and assaulting township patrons, and conducted increased raids on Camp Street, and Gerry received death threats. By this time, Scratch had evolved into an almost entirely reggae club frequented by a mostly black clientele. Finally, a group of plain clothed police attacked patrons outside the club. Jane and Gerry were among those beaten, but it was Gerry who bore the brunt of the attack, he was beaten till he lost consciousness. It was clear that Scratch’s days were numbered, and in 1983 Gerry and Jane departed for Zimbabwe, then newly independent. Henry left for Mauritius. A new generation, (among them Steve Gordon), took over the doomed club, and subsequently opened other short-lived initiatives inspired by Scratch. Gerry had also designed a mobile sound system which was used for township gigs (many of them featuring rasta deejay Jeff Thomas, a legendary figure in Cape Town’s reggae scene, who had also become one of the Scratch djs). Later, another former regular (Justin Dyssel) would open The Base at Scratch’s old premises. In Harare Gerry plugged into a thriving reggae sound system culture. He built a mobile sound system that was used in low-income communities. He had also designed a giant set of four speakers that were used for many events. These included official occasions, such as independence day celebrations in Harare stadium. Among those who used his equipment was Thomas Maphumo. Around the time he turned 50, and not long after the birth of (his son) Garvey, Gerry rediscovered his identity as a visual artist. 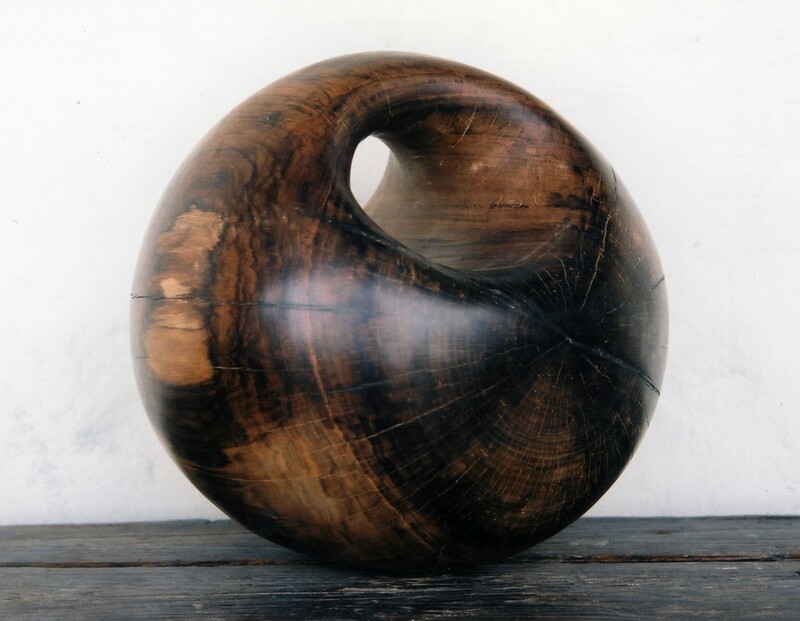 Working principally with a wide range of woods, often introducing resin and other synthetic or found materials, Gerry produced strikingly original works with a high technical finish. Many were cheeky and whimsical, with a predilection for puns and titles that were poised between the absurdity of neo-dada and incisive social critique. For just over 10 years he enjoyed reasonable critical and commercial success, exhibiting regularly in group shows at Gallery Delta and the National Gallery. 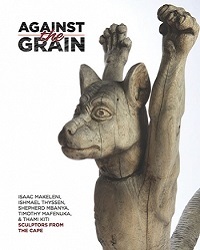 He received several merit awards for his contributions to annual exhibits at the National Gallery, and was chosen to represent Zimbabwe at the Commonwealth exhibit in New Zealand. His art was discussed at length in two articles in Gallery magazine, (edited by Barbara Murray), and he participated in two Pachipamwe workshops (part of the Triangle Network). Among his sales several works were bought by the Diehleman Gallery in Belgium. But not everything went smoothly. A sign of things to come was when Maphumo’s sound crew returned Gerry his speakers, throwing them off the back of a truck. So died a remarkable set of speakers, so ended a chapter in Gerry’s life. Another sign of things to come was when he spent a few days in jail after responding violently to a house robbery. Jane and Garvey returned to South Africa in 2000, Jane and Gerry having separated earlier. But the tipping point came during the period of so-called land invasions. Gerry was attacked twice in his home. He responded to the second attack by leaving immediately for South Africa. Gerry lived briefly in Knysna, where Jane and Garvey had settled, and then went on to house-sit in Napier (a rural village in the Westen Cape). There he met Lynne (Greenwood Smith), who offered him an indefinite stay as house-sitter, first, briefly at Napier, later at Pearly Beach (a remote village, near Gansbaai). With Lynne frequently away, Gerry spent much of his time on his own, with only Lynne’s dogs for company. 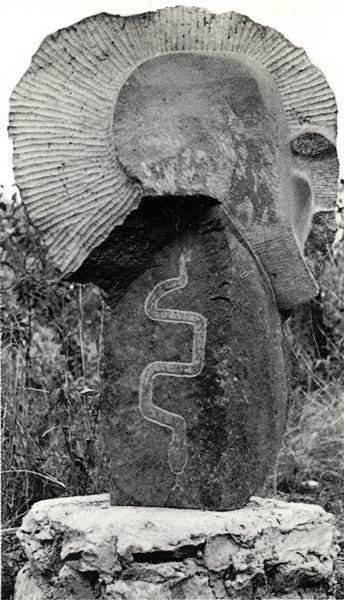 He thrived on the natural environment, and found that much of the area had a white stone that was suitable for carving. He was immensely prolific, producing many sculptures and hundreds of drawings. But, despite this late rejuvenation of his creative talent, Gerry struggled to find an outlet for his work, and he sold little. He also lost several works when galleries holding his sculptures on consignment closed down without informing him. Equally unsettling, his photographic records of his works were harshly depleted following unsuccessful efforts to introduce his works to the Everard Read Gallery in Johannesburg and the Serpentine Gallery in London. With little recognition of his work as a sculptor since his return to South Africa, living on a meager pension, and faced with a range of ongoing ailments, one could have expected that much of this late work would have been grim or negative in tone. 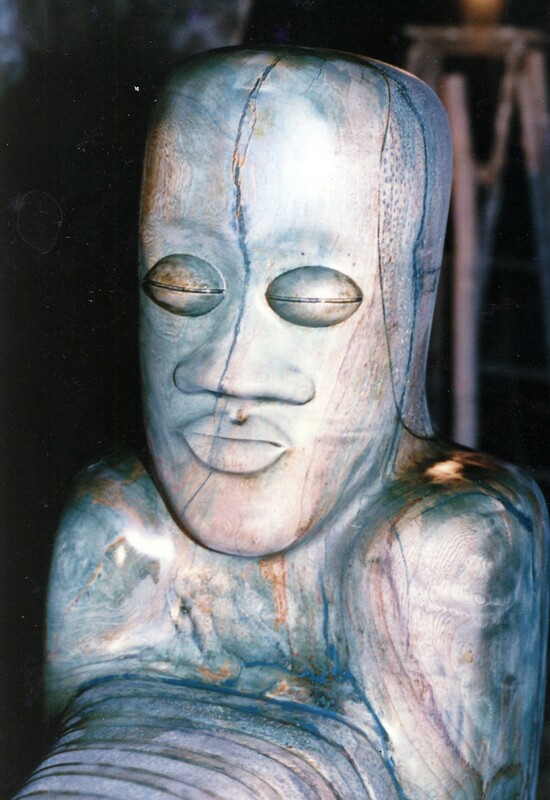 But not so, much of the work Gerry made at Pearly Beach builds on the achievements of his earlier Harare sculptures. There is the innovative approach to materials, the fine attention to detail, and a lightness of tone that expresses a delight with making, and with being in the world. That so much of this work affirms spirit serves as a constant reminder of the Gerry who, while being such a distinct and individualist character, was at heart a very social being whose vision and actions made a profound impact on the lives of many who were privileged to know him, as well as on countless others who benefitted from his generosity. Certainly, my own life was significantly affected through my friendship with Gerry, and I give thanks for the positive ways in which I grew through our exhilarating encounters. Rest in peace, dear friend.